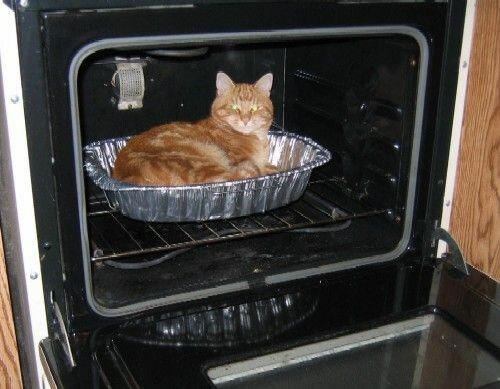 Two ravers are facing several charges after being accused of placing a cat in an oven and then trying to set it in on fire. The alleged kitty baking incident took place at a loft in Mile End. Apparently, one of their girlfriends caught them in the act, freaked out, and called the cops on them. Which begs the question -- how the hell do kitty roasters even manage to get girlfriends? Is there some kind of dating site for psychopaths out there? A friendfinder for the deranged? Not only are the men in hot water for their kittene cuisine, but when the police showed up at their place, they found a lot more than a kitty cat with burned paws; they also discovered that their desktop background was a wonderful picture of the two boys setting an abandoned church on fire, as well as several giant cases of labeled CDs that had been stolen from a local music shop a few days earlier. The boys knew the cops were coming, and yet they chose not to hide any of the stolen goods that were blatantly on display in their apartment, and they chose not to close their laptops or change their background image to something that was slightly less incendiary. They just sat around drinking beer and smoking pot until the cops showed up. Not because they didn't care, but because they were incredibly stupid. The police rescued the kitten, and charged the two dumbasses with arson, burglary, and cruelty to animals.